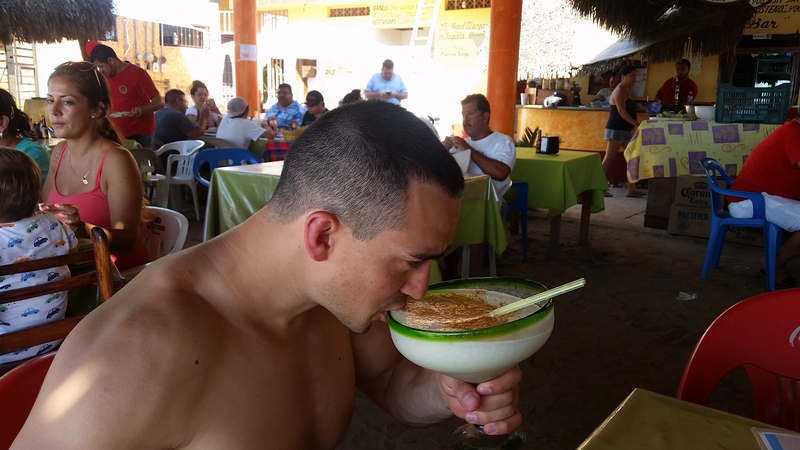 Even though I had tons of fun, I still think that this town has a few shortcomings compared to the recent trip I did to Nicaragua. I was a little disappointed that it had no motorcycle rentals. I would of loved to do some exploration on a motorcycle. Also the night life wasn’t really good, and the prices for everything were too high in my opinion. But besides the shortcomings, I still had a blast! 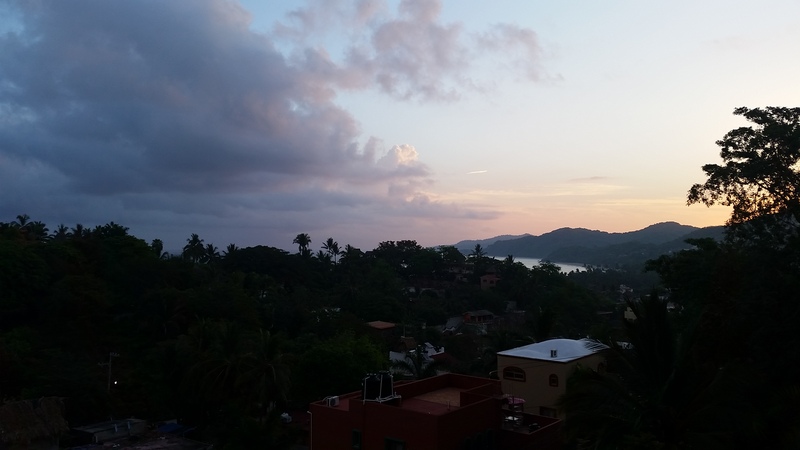 Cave diving in Sayulita, amazing dive! Lately I felt I needed to push my limits once again, I wanted to see what it feels like to go scuba diving very deep. So I decided to go down almost twice as deep then I have ever gone down to before this dive. I know that other people have done it, including my partner, so I wasn’t worried about it… on the contrary I was very excited. From the beginning, my first mistake was to not get myself familiarised with the new dry suit that I was renting out. I felt too complacent with diving, and from what I’m learning lately, this is not a very good state to be at because that’s when things start to go wrong. At that moment, I felt scared. I thought I was going to die if I were to pass out. The place that I was initially excited and in awe of visiting now felt like a nightmare that I was trying to “wake up” from. I slowly started to ascend, breathing faster with each passing moment, trying my hardest to stay conscious. I looked at my partner, who was watching me ascent, knowing that there was something wrong. As I was getting higher, my rate of climb was increasing due to the increase in buoyancy. I had to let some air out from my dry suit to allow a more gradual ascent. This would allow the nitrogen in my body time to dissolve (it’s dangerous to shoot up very quickly to the surface). For some reason though I was having trouble letting the air out from the dry suit, I was actually closing the valve instead of opening it. Another example of how I did not familiarize myself with the new dry suit before starting the dive. At that point I started to panic a bit, and after some struggle, I realised I had still some air in the BCD and I let it out. This stabilized me at that particular depth and I was able to relax and get my mind straight. My partner caught up to me, signed me asking if I was all right, I pointed out that I had a problem with getting the air out from my dry suit. We stayed at that depth for a little while, until the point when I looked at my gauge and realised that I was low on air. I was really surprised how fast my air was gone! I still needed some air to stay at 15 feet for a few minutes for decompression. So I pointed it out to my partner, and we started to ascend. Once again I was having trouble with buoyancy when I went up higher, and I had to hold on the rocks to stay at 15 feet depth for decompression. As the decompression time was up, I was already taking the last breaths from my air tank. When I finally surfaced I had no more air in my tank. Here’s a video of the dive we did on Saturday at Kelvin Grove. It was a really nice dive! Altho I heard that the locals are really unwelcoming to divers in this area, they go out of their way to call to get the cars towed away if someone dares to park on the street or on undesignated area (there’s only 5 visitors parking stalls available for the whole area). But this time the parking lot was empty and we had no problems with parking, we really enjoyed the dive! Having a partner while scuba diving is very important, it gives you that extra security when something goes wrong… And it also gives you peace of mind. While diving with a buddy is common practice, I still see some people scuba diving by themselves. And although it does involve a bit more risk, I decided that I want to see how that feels like to scuba dive by myself. And what better time to do it than during the night! Which, may I add, I had never done before either. So to help familiarize myself with that kind of dive, I decided to first do one with my buddy, and the second one by myself. I set a date to do the dives on Friday night after work. I felt a little nervous about it, but at the same time I felt very excited to and was looking forward to the new experience! 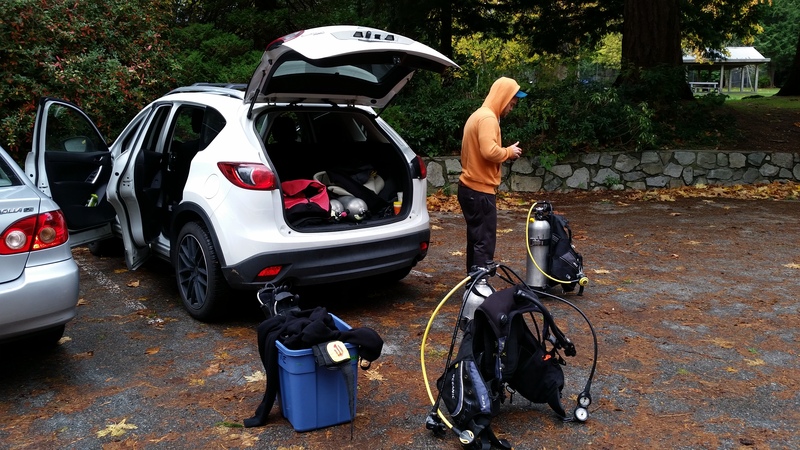 When my work finished on Friday, I went home quickly to get ready, drove to pick up my buddy, stopped at the store to get the rental gear and off we went to Whytecliff Park where our diving adventure awaited! The parking lot was empty, probably due to the rainy weather we had had that day, which actually played in our favor as we were able to grab the closest spot to the trail that leads down towards the water. One thing that every scuba diver knows about dives in cold water is how tedious it is to walk to and from the diving sites with all the heavy gear! We took our time while getting ready to allow the sun to go down, walked towards the water, swam out and submerged ourselves into the sea! The visibility that day was surprisingly really good. While everything was dark, my underwater flashlight illuminated everything under the sea really well. It was such a peaceful and surreal feeling being there. Words can hardly describe it. While some sea life was asleep – like some fish who were sleeping on the wall of the cliff – other sea life was wide awake! We went down the cliff-side to a depth of 100 feet (30 meters). We swam one way for a while, turned around and swam back gradually coming back up closer to the surface while observing different sea life underwater. 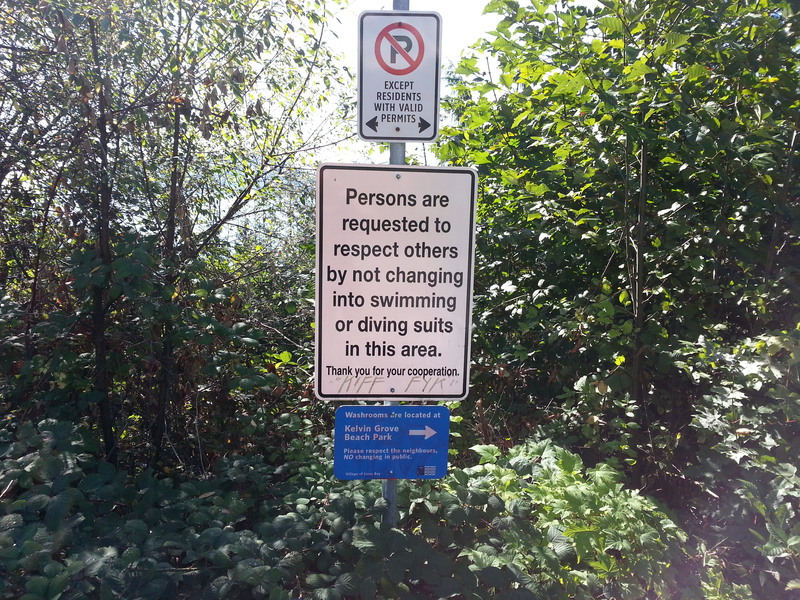 Ever since a few months ago, I started diving with a drysuit (the suit keeps the water out and keeps you dry inside, as opposed to the wetsuit). There are a few benefits to diving with a drysuit, one is that it’s much warmer, of course. But the only downside to it, which was a big disadvantage for me on this dive, is that you can’t pee in it (unless you want all your dry clothes to be soaked in pee lol). Prior to the dive, I have made a huge mistake by drinking a large cup of coffee, which in effect made me want to pee every 5 minutes. After about 5 toilet breaks, before putting all of my gear on, I was hoping that would be the last of it. But unfortunately, as we were going into the water, I was feeling a new batch brewing. The first half of the dive was fine, it didn’t affect my concentration. But towards the end of the dive, it felt like I was going to burst! When we came out, I had to move so quickly in order to get rid of my gear…. I almost failed to hold it in, it was a really close call… Never again will I drink large portions of coffee before diving. The next dive was the solo dive. I was a little nervous about going in by myself, but I knew I had to do it. I changed the air tanks, got my gear ready, went in the water and dived in. At first, I was scared, being in the dark in the ocean alone can be quite daunting. But as soon as I was underwater, I felt much calmer. I was able to relax and enjoy the experience. I didn’t go too deep this time, I stayed at around 50 to 60 feet deep. The dive was relatively normal and nothing too crazy happened during it. I was on my way up and coming closer to the surface when I saw something pass by. It was murky near the surface so it created a ghost-like effect, I was trying to figure out what it was and I realised that it was a seal! It quickly swam by me a couple more times, still keeping its distance, then it disappeared. It was a really cool experience! After that night, I fell in love with night diving, and I’m looking forward to do more night dives in future! Here’s a video of one of my coolest dives I’ve done so far… This one is a drift dive, it’s when a current drifts you underwater. The drift took us down to 100 feet deep, when I had a cool encounter with a big Cod fish, it’s head was massive! Was a super fun dive! The idea of being able to dive and explore sunken ships has struck me as fascinating for quite some time now. 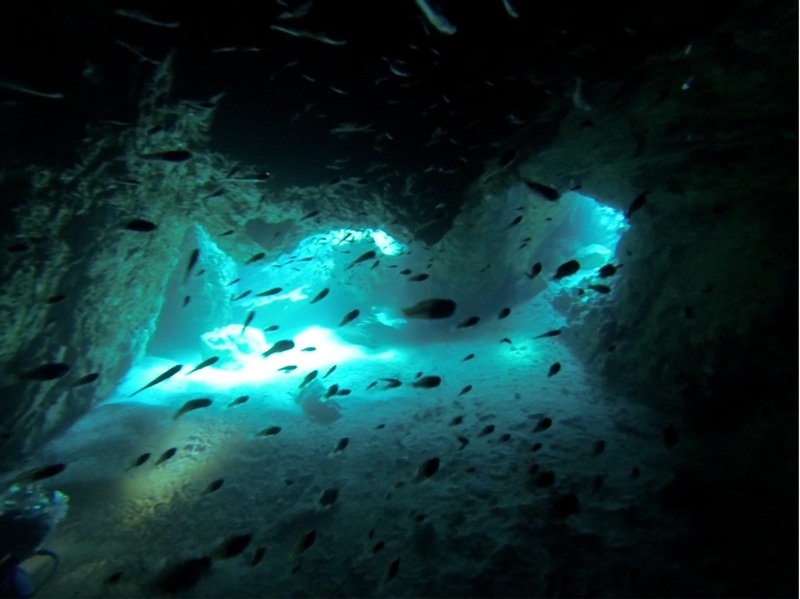 Wreck and cave diving have been on my bucket list ever since I first started to scuba dive. Taking the wreck diving course is only the beginning of what I’d like to accomplish as a diver. My skill level and knowledge on the topic still need a bit of improvement. One day, I would love to be able to penetrate the most complex ships with confidence. With the knowledge that my skill level is in fact advanced enough to do the most dangerous explorations. But I guess that’s for a time in the future…. After I completed the wreck diving specialty course, I discovered it was a simple, yet vital course. The course trains you on how to be a safer diver when you’re diving wrecks. The course comes with a knowledge book (that mainly consists of common sense knowledge) and you complete four dives in the wreck where you have to perform a few skills. The first couple of dives were at a little place named Porteau Cove. I was so excited before I started diving those wrecks, but after the first dive.. I really haven’t been very impressed by them. The ships are extremely compact and there isn’t a whole lot to explore. The sea life that formed on it was somewhat interesting, but that’s about it. Also, the visibility that day was awful. I wasn’t able to see more than 5 feet in front of us. Nevertheless, I did the exercises that were required of me, which was to sketch the ship while underwater. I found the task to be fairly simple, but the visibility did make it somewhat of a challenge. I was told that my sketch was well done and matched the scale of the ship (Then again, I am a draftsman by profession lol). The next day, we returned to Porteau Cove to do two more dives to finish out the course. I had to demonstrate the line work, which is used for wreck penetration. Much to our surprise, our day did not go as we planned. We got ourselves suited up, walked clear to the shore with all of our heavy gear, swam out to the buoy, and suddenly.. My mouth piece started gushing out air at a rapid pace! I frantically tried everything to stop the air leakage, but nothing was effective. By the time that I finally stopped the air leak, most of the oxygen from the tank was gone! So we had to swim back to shore and walk back to the car to fix the mouth piece and change the air tanks. Did I mention that I did a very intensive leg workout the day before? So obviously, the walk and swim were not very pleasurable! After the instructor fixed the mouth piece (there was sand in it that needed to be cleaned off), we changed tanks and got our gear all ready to go. Then all of a sudden the seal from the tank to the regulator blew and started to gush out air. I reacted fast and stopped it pretty quickly, so it didn’t let too much air out of the tank. Now, my instructor and I are both wondering, “Is the universe trying to tell us something?” We considered the thought that maybe, just maybe we shouldn’t attempt to dive today. Both of us aren’t superstitious people by any means, but sometimes you can’t ignore certain signs! So I said, “If something happens again, we’re not going diving.” What do you know, 5 seconds after I said that, the seal blew off again. So we decided to call the whole day off. After that day, I’ve decided that I’d rather finish the course somewhere a little more intriguing than Porteau Cove. So, I have decided to make a trip to Nanaimo to finish my wreck course. 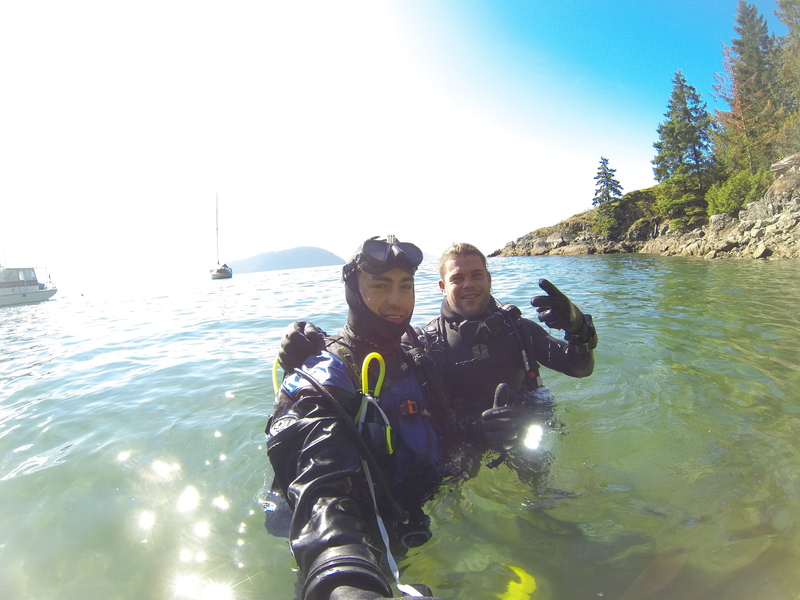 The previous weekend, we trekked to Nanaimo in Vancouver Island to do a little wreck diving. Keep in mind, it’s been a while since I wanted to dive the wrecks in Nanaimo because they are big and somewhat more complex than the ones in Porteau Cove. Either way, I was very excited to do those dives. The experience alone was totally worth it! Now I want to go back there to explore more of the ships! Our first dive was HMCS Saskatchewan, which is a 336 foot destroyer. Being over 100 feet deep felt totally unreal. Though I didn’t get a chance to explore much of the ship because I had to do line work, I will definitely have to go back there again! The last dive we completed was a different wreck, Rivetow Lion. Rivetow Lion is a deep sea rescue tug for the British Navy. This dive has been so much more fun for me than the other dives because I was able to just sit back, explore, and enjoy it without doing any exercises. Want to see my adventures for yourself? Watch the video of my wreck diving course!